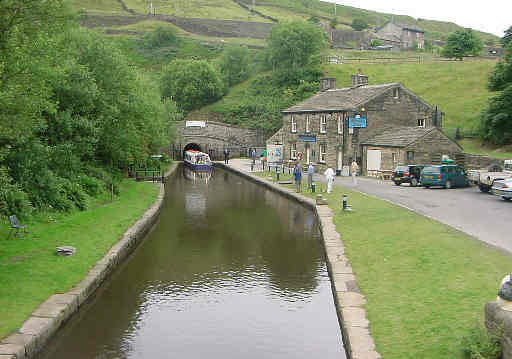 Standedge Tunnel is the longest, highest and deepest canal tunnel in Britain! Situated midway along the Huddersfield Narrow Canal, the tunnel takes the canal under the high Pennine spine of Northern England between Marsden in the Colne Valley and Diggle in Saddleworth. Standedge Tunnel trip boat at the Marsden portal, with Tunnel End Cottages on the right. Originally opened in 1811, the tunnel has been restored and was re-opened in 2001. Boaters wishing to travel through the tunnel with their boats should see the Information for Boaters page and check The Canal and River Trust's Standedge website for the latest information. A highlight of a visit to Tunnel End is a boat ride into the tunnel. The rides start from Tunnel End Cottages at the tunnel mouth and go about 500 metres into the tunnel. For dates and times of boat trips please check The Canal and River Trust's Standedge website for the latest information. The nearby former canal warehouse was restored to create the Standedge Visitor Centre. Admission to this is free and it is open on the same days as the tunnel trips (see above) and also daily during school summer holidays. Follow these links to find out about different aspects of Standedge Tunnel.